Though primarily known for her works of mercy feeding and housing the homeless of New York City, Dorothy Day did not neglect the works of justice. In her writing and through her activism, she sought to change the conditions in our society that create poverty in the first place. She was arrested and jailed for two weeks for demonstrating in support of striking farm workers. This was only one of many protests she participated in during her long life. Dorothy was consistently and outspokenly anti-war, even during World War II when that stance was very unpopular. She clashed with the American bishops over their support of the war in Vietnam. Dorothy was truly a radical, in the sense that our word “radical” comes from the Latin word for “root”. Her dedication to peace and justice, which she considered central to the Christian life, co-existed with her devotion to the teachings of the Church and a love of its traditions and liturgy. Dorothy loved doing works of mercy because they allowed her to take direct and immediate action for her brothers and sisters in Christ and against the ills of society that robbed them of their life, freedom, and dignity. Her engagement with other people flowed from her wholeness as a person; her heart and mind were cultivated through her reading, reflection, conversations, writing, and worship. She wanted the fullness of life for herself and every person. By her public words and work, Dorothy sought to imitate Christ's witness against injustice, even when such witness seemed folly. Like Christ, she was critical of the powers and structures of injustice and endured ridicule and opposition for her witness. 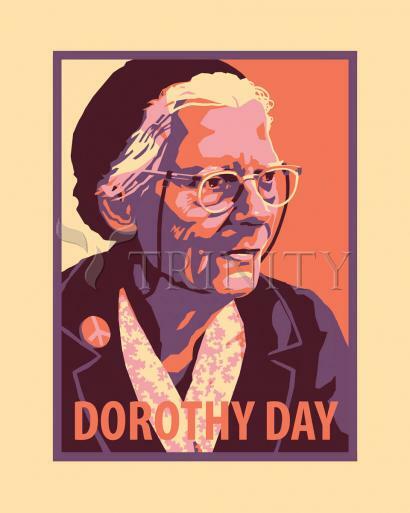 A steadfast pacifist, Dorothy opposed all wars and the use of force and violence to solve human problems. She practiced and promoted human dignity with the spiritual weapons of prayer, fasting, almsgiving, civil disobedience, and works of amendment. Like Jesus, the woman at the well, and St. Paul, she took her message to the people in the streets. Dorothy looked to sacramental celebrations, especially the Eucharist, for daily spiritual sustenance, and she saw the world, its people and all of nature, to be full of God's grandeur and love as well. In good times and in bad, Dorothy had a keen sense of appreciation and learned to trust in the providence of God. Dorothy regularly expressed gratitude not only to God but to those around her and to The Catholic Worker's readers.